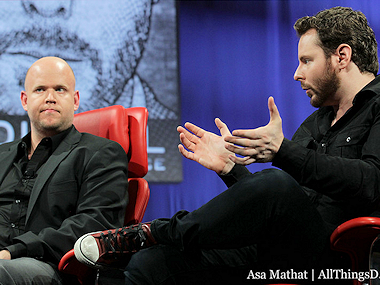 At the 10th D: All Things Digital earlier this month, we paired online music’s best known entrepreneurs — Daniel Ek and Sean Parker. They now work together at Spotify — Ek as CEO and Parker as investor/adviser (he played a similar role in the early days at Facebook). While they discussed a lot — from the importance of social on the sector to the virtues of playlists on the service — Parker also got off the best zinger against Apple, noting that it might have kept Spotify from landing on U.S. shores for two years. “There was a sense in which Apple was threatened by what we were doing,” he said.